The earliest records of packed lunches in Japan date back to around the fifth century, when people going out to hunt, farm, or wage war took food with them to eat on the job. They typically carried dried rice, which was eaten either in its dried state or after being rehydrated with cold or hot water, or rice balls. According to the Nihon Shoki (Chronicles of Japan), one of Japan's oldest historic records, falconers used feed sacks as lunch bags when they went out hawking. And Ise Monogatari (Tales of Ise), a tenth-century collection of lyrical stories, contains illustrations of people eating dried rice during a trip. The word bento is often said to have originated with a sixteenth-century military commander named Oda Nobunaga (1534-82), who fed the large numbers of people at his castle by having food handed out to each individual. 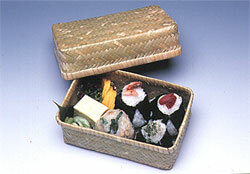 The word bento was coined to describe the simple meals that were distributed in this manner. Traditionally, people working outdoors - whether in the fields, in the mountains, on fishing boats, or in town - carried their lunches with them because they did not have time to go home for meals. These box lunches were typically built around such staples as white rice, rice mixed with millet, or potatoes, depending on the region. During the Edo period (1603-1868), people considered bento an essential accompaniment to outdoor excursions or the theater. The makunouchi bento, which typically contains small rice balls sprinkled with sesame seeds and a rich assortment of side dishes, made its first appearance during this era. 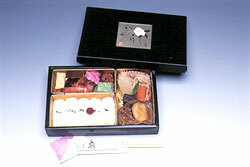 Makunouchi refers to the interval between the acts of a play, and the bento is said to have gotten its name from the fact that spectators ate it during intermission. In the Meiji period (1868-1912), when Japan's railway system came into being, the ekiben ("station bento," or box lunches sold at train stations) appeared. The first ekiben - rice balls with pickled apricots inside - was reportedly sold in 1885 at Utsunomiya Station in Tochigi Prefecture. 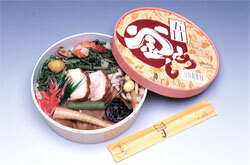 Ekiben are still sold at Japanese train stations today in vast quantities.